On his 2005 release, Beck brings back the funk and returns to the goofy grooves of his previous albums. Don't get me wrong, I love 2002's Sea Change, but it is nice to hear Beck in his element once again. 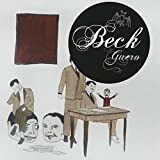 It's a little strange for one of this rock chameleon to release a "classic Beck" album, but that's what Guero is and Beck pulls it off well. "E-Pro" fits along well with earlier hits like "Where It's At" and "Loser", while "Girl" and "Hell Yes" make you want to put on your best pair of sneakers and dance around. This was my first Beck Album, and i was blown away. This CD didn't leave my player for at least three weeks. He uses some very basic beats behind all the songs(except for a few) which works, but i can't help but wonder how a live drummer would have effected this album. I'd say that every track on here is great except for Qu� Onda Guero(just rather boring)and Black Tambourine(beat sounds just like E-Pro).